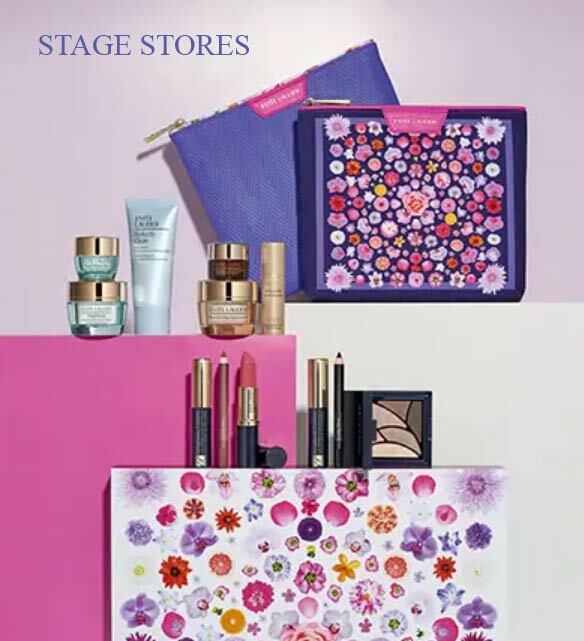 Starting from April 15, 2019 there are 2 Estée Lauder gifts (each one includes 7 items, valued at up to $170) available on Nordstrom website and in U.S. stores. Spend $85 on Fragrance (any brand) and enter promo code YELLOW at checkout to receive a free 12-Piece Gift. Promo code (LIFT) is required to be entered to qualify for a gift. Nordstrom offers free shipping with any purchase and you can also choose 3 free samples at checkout. Note the offer may vary in store. 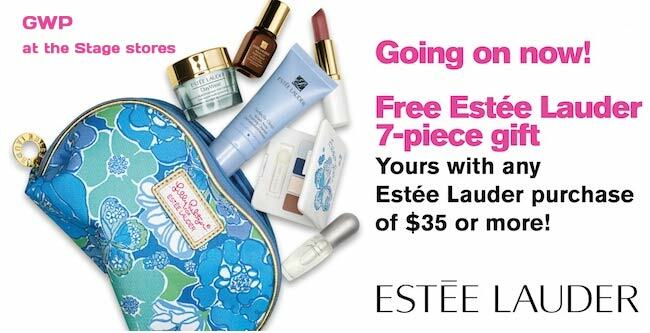 Spend $37.50 on Estee Lauder at Belk online and in stores and receive a free 7-piece gift. Worth up to $145. At Belk you will also receive free shipping. Note: We saw this gift at L&T in January 2019. EL gifts at Bloomingdale’s: Online 3/25 – 4/14 | In stores 3/26 – 4/14. Spend $37.50+ and choose between two skincare and make up sets (up to a $150 value). Offer may vary in store. Spend $75+ and choose your skincare trio (Firm, Smooth & Glow OR Recharge Your Radiance). Online only. While supplies last. 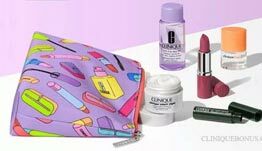 If you are a Bloomingdale’s Loyalist (it’s free to join), you will also receive free shipping with any beauty order. 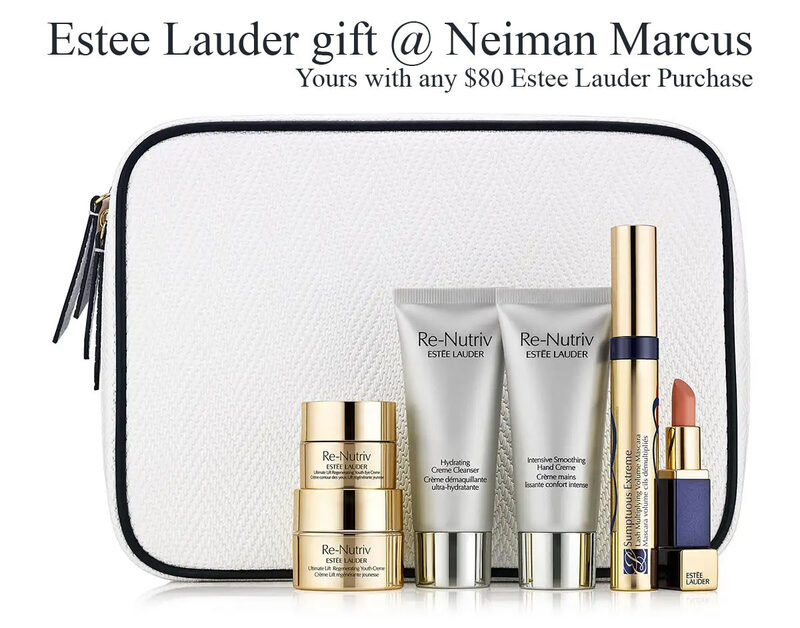 Starting from March 12, 2019 there is a 5-pc Estee Lauder gift at NORDSTROM (online and in U.S. stores) – free with any $125 Estee Lauder purchase. Gift will appear in your shopping bag while it’s still available. 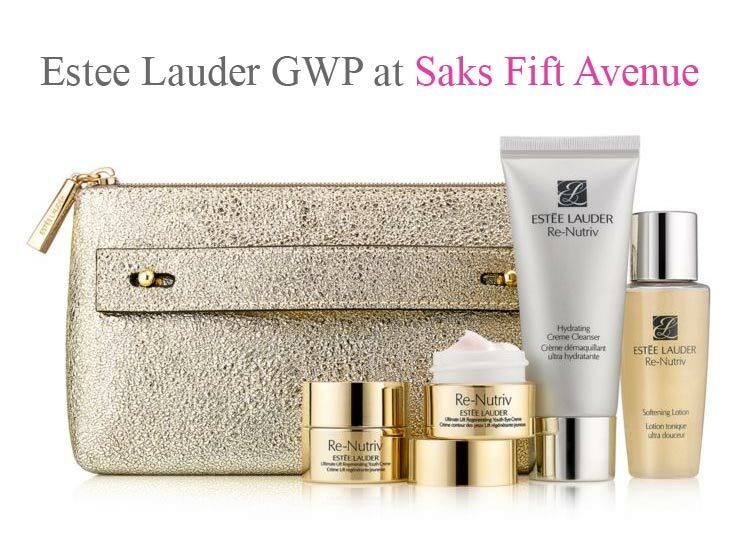 Note: the next GWP offers are coming soon to Von Maur, Belk and Bloomingdale’s. 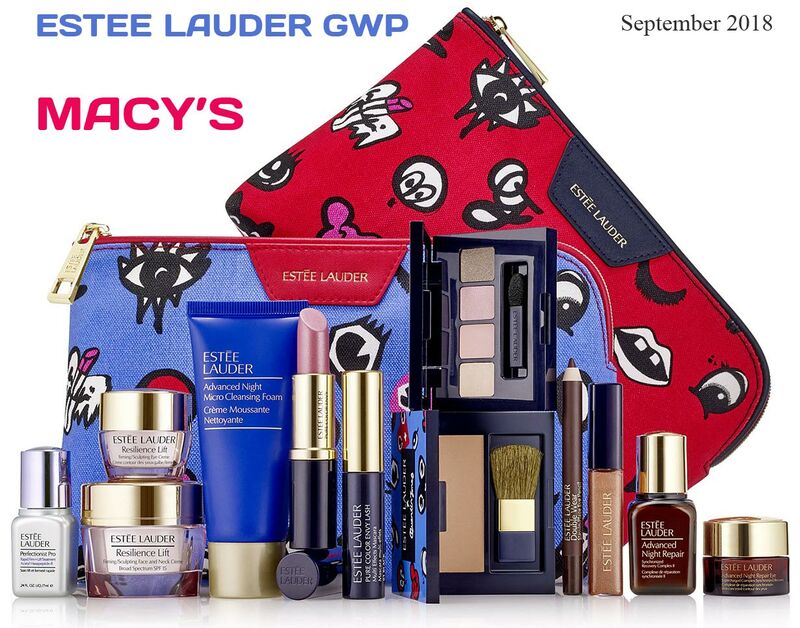 With any $37.50+ Estee Lauder purchase at Macy’s online and in-store receive a free 7-piece Estee Lauder gift (valued at up to $155). Enter code VIP at checkout and get 15% OFF select regular-priced, sale & clearance cosmetics & fragrances – now through March 24, 2019. You will also receive free shipping with any $49 beauty (any brand) purchase. Customize your 7-piece Estee Lauder gift at Lord & Taylor – with any $37.50 purchase. Spend $75 and also choose a bonus skincare trio. 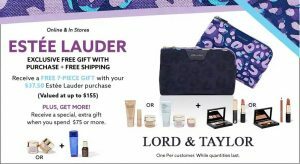 There is an Estee Lauder gift at Boscov’s yours free with any $37.50 Estee Lauder purchase. Want more? spend $75 or more and choose your additional 3-piece gift (skincare trio). You will receive free shipping when you spend $49 on beauty or more. 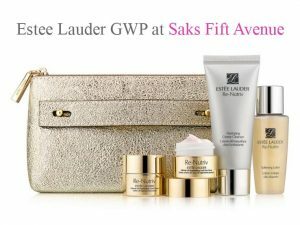 Spend $125 on Estee Lauder and enter promotional code ESTEE2SF at checkout at Saks.com to receive a free 7-piece gift. The gift includes: Re- Nutriv Ultimate lift Regenerating Crème (0.24 oz. ), Re- Nutriv Ultimate Lift Regenerating Eye Crème (0.24 oz. ), Re-Nutriv Softening Lotion (1.01 oz. ), Re-Nutriv Hydration Crème Cleanser (1.01 oz.) and a Cosmetic Bag. You can also enter promo code FREESHIP for free shipping. Offer ends on March 3, 2019. 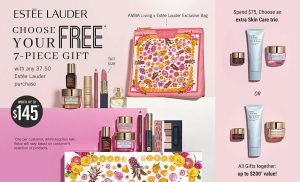 Online exclusive direct from EsteeLauder.com – a free 8-pc spring Estee Lauder gift. Yours free with any $45+ purchase. Up to a $170 value. Smooth, Firm, Glow: Includes Revitalizing Supreme + Best Sellers and more. Pure Radiance: Includes New Nutritious Best Sellers and more. 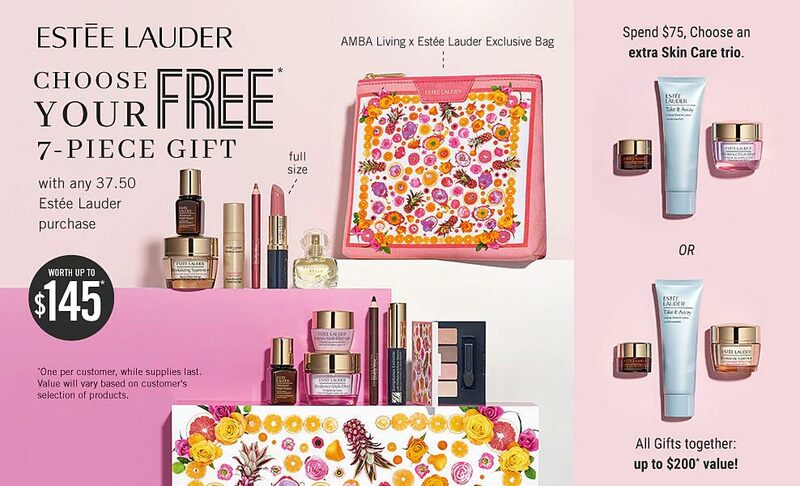 Every gift also includes an exclusive AMBA Living x Estee Lauder wristlet duo with removable bow. To add this extra 3-pc gift you have to enter offer code SPRING19. Your 10-Piece Gift worth over $220. 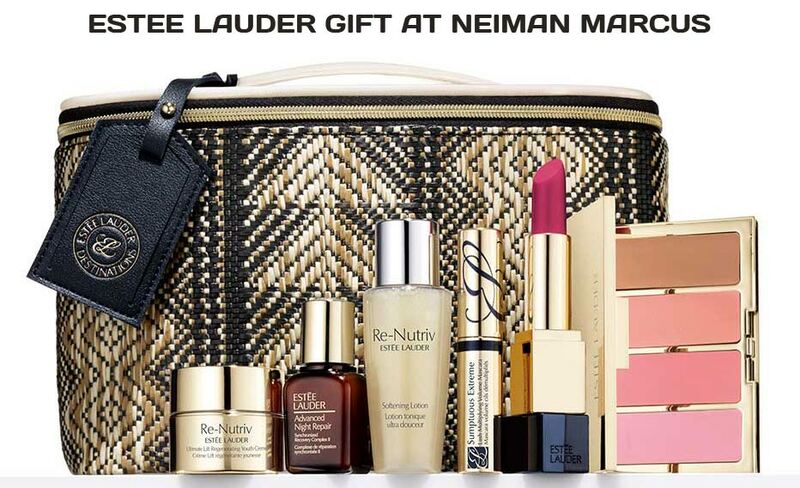 Receive this exclusive cosmetics bag + beauty gifts from Neiman Marcus – free with any $80+ EL purchase. Online and in stores. Promotion ends on January 28, 2019. 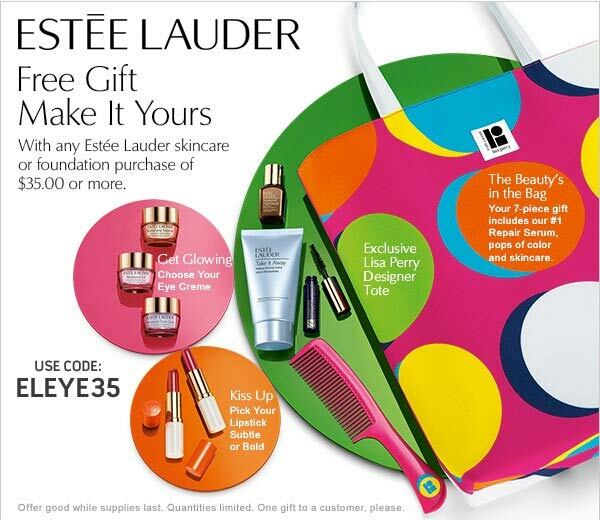 There is a free 6-piece Estee Lauder gift at NORDSTROM. Yours free with any $45+ Estee Lauder purchase. The gift includes: a cosmetics bag, a full-size Pure Color Envy Sculpting Lipstick in Stripped, and deluxe samples of Sumptuous Extreme Lash Multiplying Volume Mascara in Extreme Black (0.1 oz. ), Revitalizing Supreme+ Global Anti-Aging Wake Up Balm (0.17 oz. ), Advanced Night Repair Synchronized Recovery Complex II (0.24 oz.) and an 8-Pan Eyeshadow Palette. You will also receive free shipping. Plus, if you spend $125 on beauty (any brand) you will receive a free 17 piece gift valued at $129. *While supplies last. Online only. Take off with the absolute luxury of travel-sized Re-Nutriv Ultimate Lift Regenerating Youth Creme and Eye Creme plus Re-Nutriv Softening Lotion. Touch up your look any time with a full-size Pure Color Envy Paint-On Liquid LipColor and travel-size Sumptuous Extreme Mascara. Plus, choose your Aerin fragrance you want: For Hibiscus Palm enter code ESTEE65; for Mediterranean HoneySuckle enter code ESTEE66 or for Tuberose enter code ESTEE64. You must enter one of the promo code above to receive the 7-piece gift. 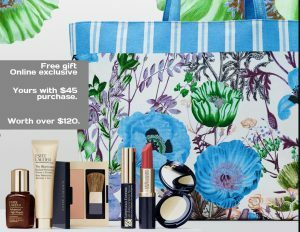 Spend $125 on Estee Lauder and you can also enter promo code ESTEE67 to receive a luxurious striped scarf designed by Aerin. Also, enter promo code FREESHIP for free shipping. 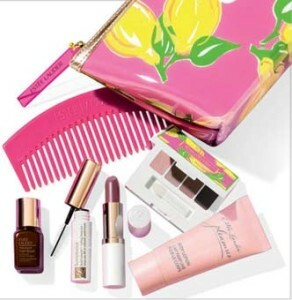 Spend $37.50 at Bloomingdale’s and receive this complimentary 7-piece Estee Lauder gift. If you are a Loyalist (it’s free to join), you will also receive free shipping with any beauty order. 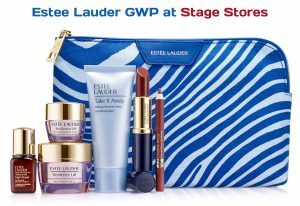 Receive this complimentary 7-pc Estee Lauder gift set from Lord & Taylor – when you make Estee Lauder purchase of $37.50 or more. The gift will be automatically added to your bag. Plus, there is currently a special promotion at L&T so you will also receive free shipping. Offer available while supplies last. 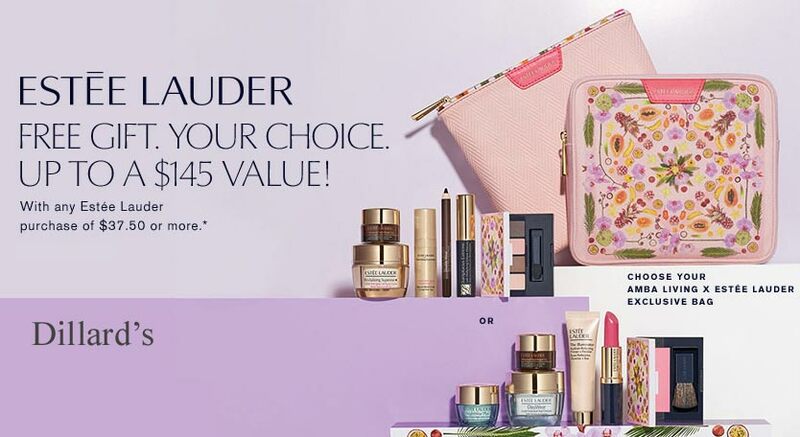 Make Estee Lauder purchase now at Von Maur ($37.50 or more) and choose your free 7-piece gift (valued at up to $155). Choose from four Estee Lauder gifts, while supplies last. Spend $75 or more and also add your choice of eye trio. Free shipping and free gift wrap is available at Von Maur. 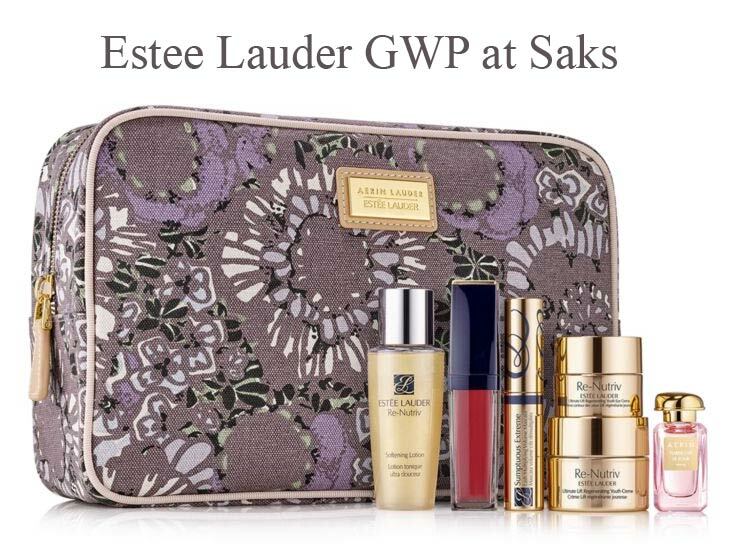 Spend $100 or more on Estee Lauder now at Saks.com and choose your complimentary Estee Lauder gift. There are two 5-piece gifts, each valued at up to $180. ESTEE7B – and receive Double Wear Stay-in Place Lip Pencil in Rose, Pure Color Envy Lipstick in 420 Rebellious Rose, Perfectionist Pro Lift Serum, Double Wear SIP Flawless Wear Concealer in Light/Medium and pink bag. ESTEE7A – and receive Double Wear Stay in Place Lip Pencil No. 04 Rose, Double Wear Stay in Place Flawless Wear Concealer No. 2 Light Medium, Lipstick No. 420 Envy and Perfectionist Pro Rapid Firm+ Lift Treatment and blue bag. You can also enter promo code FREESHIP for free shipping and code ESTEE63 for two extra free minis. Offer valid at Saks.com through Friday, November 16, 2018 at 11:59pm(ET) or while supplies last. Receive this complimentary Estée Lauder 7-pc. Resilience Lift Set with any $37.50 Estee Lauder purchase at Stage Stores. Step up gift: Resilience Lift Night Lifting/Firming Face & Neck Creme with qualifying Estée Lauder purchase. Shipping is free when you spend $75 or more, otherwise $9.95. 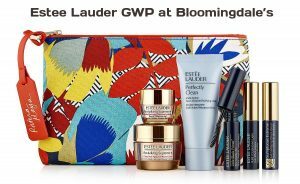 Spend $37.50 on Estée Lauder at Nordstrom online or in U.S. stores (note that in-store offer may vary) and choose one of 2 available seven-piece Fall gifts (valued up to $166). FREE. Plus, if you spend $75 or more, you will also receive three-piece Wake Up Beautiful skin care set. While supplies last. Up to $240 combined value. Free shipping. While supplies last choose your 7-pc Estee Lauder gift at Belk when you spend $37.50 or more. Worth up to $165. Spend $75 and choose a bonus day cream and eye cream travel size duo (DayWear or Resilience Lift). Free shipping. 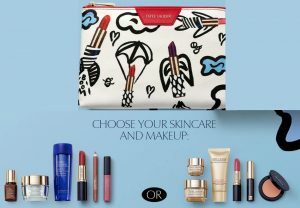 Exclusively online on EsteeLauder.com website choose your free 7-piece gift with any $45 Estee Lauder purchase. Worth up to $145. If you spend $75 or more you will also receive a bonus Nighttime Skincare Trio when you enter code FALL18 at checkout. Your 10-Piece Gift worth up to $210! Note we saw this gift from them at the end of August, it is back in stock while supplies. You will also receive free shipping. 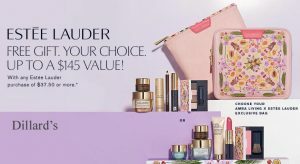 With any $37.50 Estée Lauder purchase choose your 7-piece gift (up to $165 value) at Macy’s website now, online only. Spend $75 & choose an extra full-size gift. Up to $220 value. You will also receive free shipping. No promo codes needed. All gifts while supplies last, the gifts will be added automatically at checkout, if not, they are out of stock. Update: now also at Boscov’s with free shipping when you spend $49 or more on beauty & fragrances. Starting from August 10, 2018 you can choose your free 7-piece Estee Lauder gift at Dillard’s online and instores when you spend $37.50 or more. Worth up to $165. Spend $75 and choose an extra skin care trio. Both gifts together worth up to $220. While supplies last. 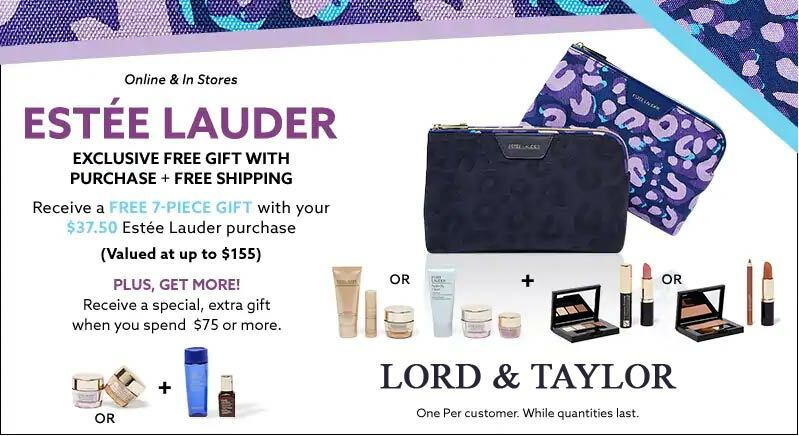 Receive your 7-piece Estee Lauder gift (worth up to $155) at Lord & Taylor – free with any $37.50 Estee Lauder purchase or more. Receive a special, extra gift when you spend $75 or more – Advanced Night Repair Face Serum, Gentle Eye Makeup Remover, and your choice of Resilience Lift Firming/Sculpting Eye Creme or Revitalizing Supreme+ Cell Power Eye Balm). Choose your gifts at checkout – click on the “Select your free gifts” button below the items in your shopping bag, no promo code needed. 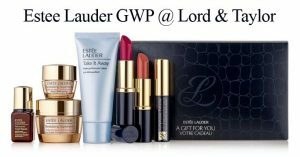 Get more with Estee Lauder purchase of $100 – three extra gifts. A combined value up to $240. In-store offer may vary. 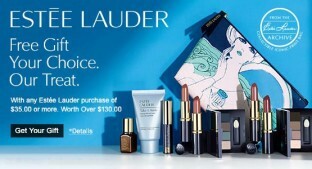 Online exclusive gift direct from EsteeLauder.com website – Yours with $45 purchase. Worth over $120. Step up your gift: With any $75 purchase, add an Advanced Night Repair Trio to your gift. Your 10-Piece Gift worth over $155! Use offer code SUMMER18. 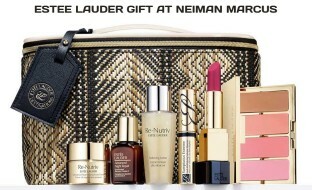 There is an exclusive cosmetics bag + beauty gifts with $80 Estée Lauder purchase at Neiman Marcus. Online + instores. In-store offer ends 01/28/18, online while supplies last. Optionally, you can spend more ($125) and also choose a full-size eye palette, eye cream, or cleanser. The gift will be added automatically to your shopping bag. If not, it is out of stock. Receive a 7-piece gift, choose your skincare duo and makeup trio. To qualify spend $35 or more on Estée Lauder at Von Maur. Spend $75 and choose Deluxe EyeShadow Palette or Skin Renewing Night trio. Note: we saw this GWP at Lord and Taylor 2 or 3 months ago. 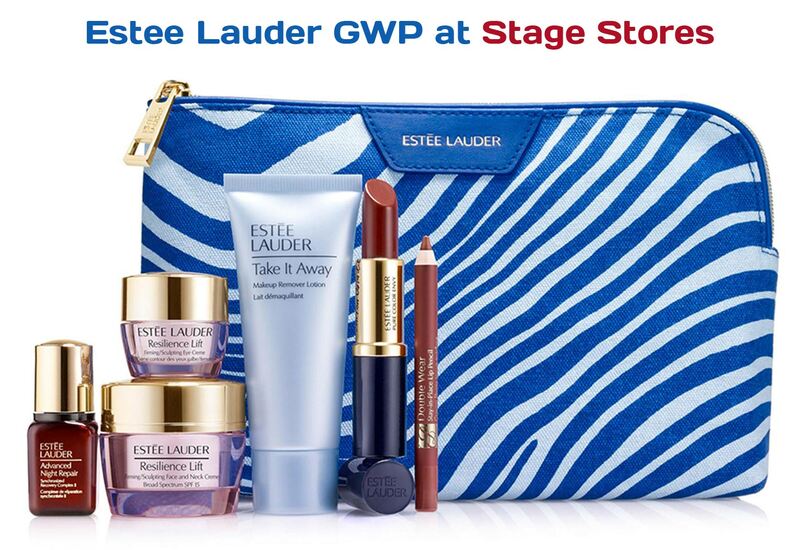 Spend $35 on any Estee Lauder products now at Von Maur to get the base 7-piece gift. If you want more, you can spend $7o (in total) and you will also receive your choice of Pure Color Envy Eyeshadow Palette or Deluxe Skincare trio. This offer can be combined with their Holiday Blockbuster offer. Free shipping. Choose Subtle or Bold gift choice – free 7-pc gift with any $35.00 Estée Lauder purchase at Bon-Ton. Online and instores (online one day early – starting on 4/11). Over $130 value. deluxe size Resilience Lift for face and eye – free with any $65.00 purchase. Total value of both gifts: over $165. 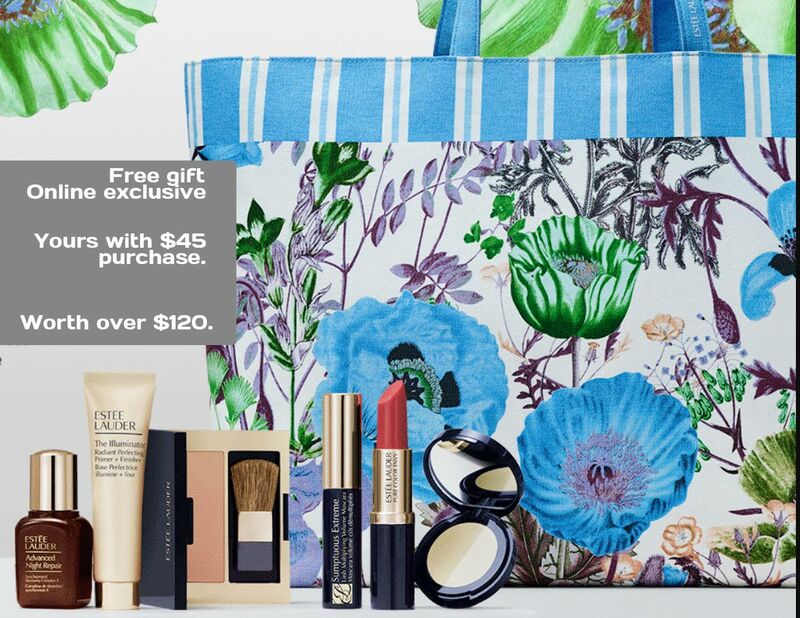 This is a fresh summer gift which is available online on Belk website with Skincare or Foundation purchase of $35.00 or more. Promotion started on Tuesday 10th of June 2015. Good while supplies last. Update: Check the availability of this gift, as it might be already sold out or the offer expired. Spend $35 or more on products from skincare or foundation section at Boscovs and you will receive this EL gift for free. It includes Advanced Night Repair Serum, Sumptuous Bold Volume Lifting Mascara in Black, Take It Away Lotion Makeup Remover, Pink Comb with dots on handle and your choice of lipstick and eye cream + all packed in an exclusive Lisa Perry Designer tote. You need to enter this promo code: ELEYE35 in order to receive the gift. You can also qualify for free shipping – with any beauty order over 49 USD (no code required). One day ago started another promo – at Stage stores. Estée Lauder gift (includes: a bag and 6 products. check the picture below) can be yours with $35 purchase. Complimentary. Online or in selected stores, but you can also make the purchase by phone: use toll free number: 1-800-743-8730. Available dates for the promo: 4/28/14 – while supplies last. 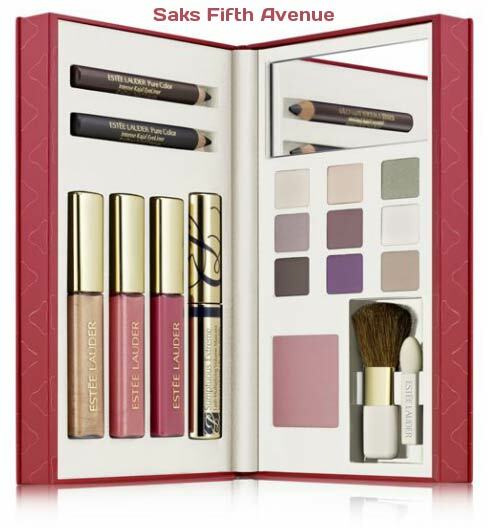 With $175 purchase receive this Pure Color Gift Collection (Includes nine coordinating eyeshadows, blush in Mauve Mystique, three lip glosses, two Intense Kajal Eyeliners and Sumptuous Extreme Mascara, tucked in a sleek folio case). Offer is available now at Saks fifth avenue. In order to get the gift you need to enter promotional code LAUDER63 at the checkout page. 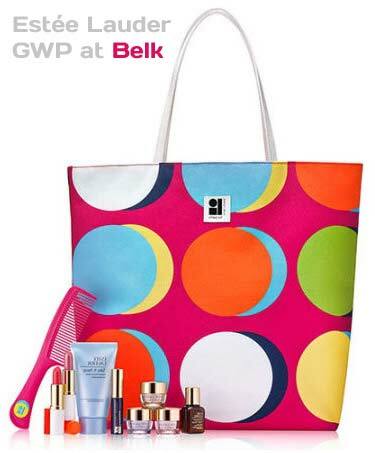 The tote Lilly Pulitzer GWP which has been available at Belk and BonTon is now also at Von Maur stores. The purchase requirement remains the same ($35). Both gifts only once per customer, per even and while supplies last. Quantities are limited. However, if you don’t have this store nearby, you can still make the purchase via phone and you will be also eligible for the bonus. Keep in my the shipping cost: 12.75 USD. Call 800-558-1855 ext. 2741 and ask for Donna. Offer available until March 24. Unfortunately, I don’t have any picture to be shared with you, ladies. 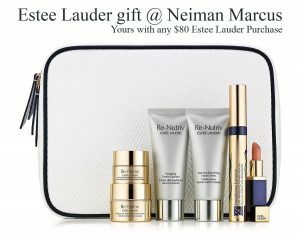 Any chance do you know what the Estee Lauder GWP at Neiman Marcus will be? I know it is to start on Jan 16th yet I haven’t received any mailings about it. 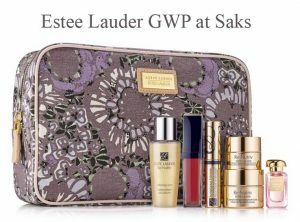 I thank you many times over for posting the Estee Lauder GWP at S5A. That’s a very cool GWP. My purchased was made earlier by phone as S5A is no longer in San Diego, only the Saks Off Fifth. I’m looking forward in receiving it. is there anything for Australia?